Google held an event entitled “A taste of what’s new from Android” at its Mountain View offices earlier today. If you did not have a chance to tune into the official YouTube Live Stream or catch our updates on Skatter Tech LIVE, here is the full scoop. The event primarily revolved around Honeycomb, which is the codename for the brand new tablet-optimized Android 3.0 operating system. Although Google let most details loose at CES 2011 last month, the company presented a further in-depth look at the OS today. 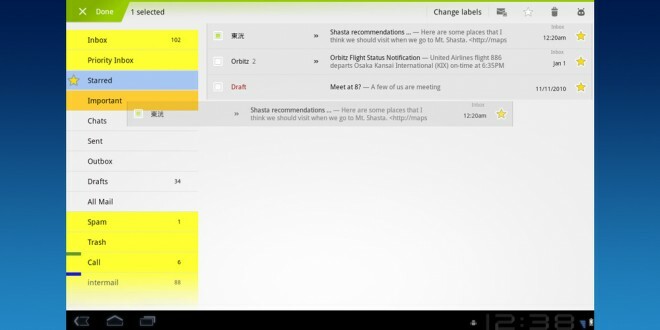 Widgets are already a large part of the Android 2.0 series, but these will become more powerful and useful in Honeycomb. Rather than presenting a grid of endless icons, interactive widgets offer quick previews. Switching applications is also easier since Android 3.0 now displays thumbnails of running applications over icons. Android is well-respected for a great smart phone notification platform, but Google is revamping the experience again for tablets. Rather than drop down notification bar, there are miniature icons by the clock at the lower left corner of the screen. It is somewhat reminiscent of traditional Windows status icons, but these offer more interaction. For instance, users can accept or deny an incoming call, which includes a person’s name and profile image, from a notification without interrupting their workflow. Also demoed was a quick access settings popup for controlling wireless networks, orientation, brightness, and alerts. 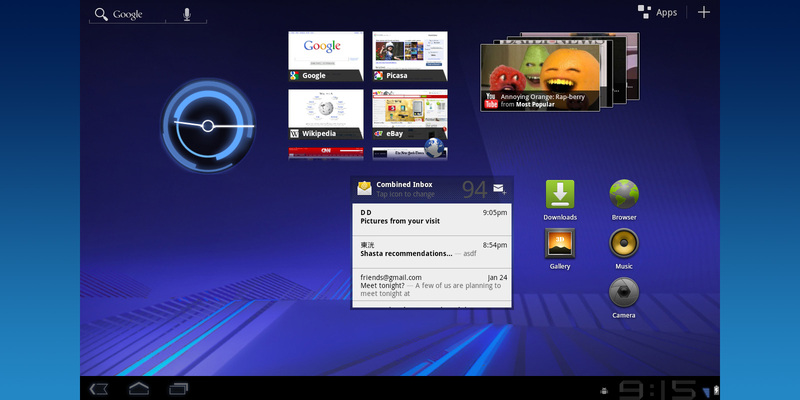 Devices such as the Galaxy Tab and the Epic 4G already have similar features thanks to Samsung’s custom TouchWiz interface. Last but not least, music notification icon offers the ability to control playback from the task bar. Google claims that all existing Android apps should work on the tablet operating system without forcing developers to make changes. With that in mind, developers can choose to use the new SDK to take advantage of the larger screen sizes. A completely revamped Gmail app now offers drag and drop organization, priority inbox, labels, starred items, threaded conversations, and much more. CNN also announced a new app which offers instant access to the latest stories, live video streams, and support for iReporters. A cover flow inspired new default music app was also briefly shown. A few other third-party Honeycomb apps include AccuWeather, Disney Mobile, The Economist, Intuit LogMeIn, Pulse News, QuickOffice, Time Magazine, and WeatherBug. Google will announce more new apps at Mobile World Congress in Barcelona on February 14th. 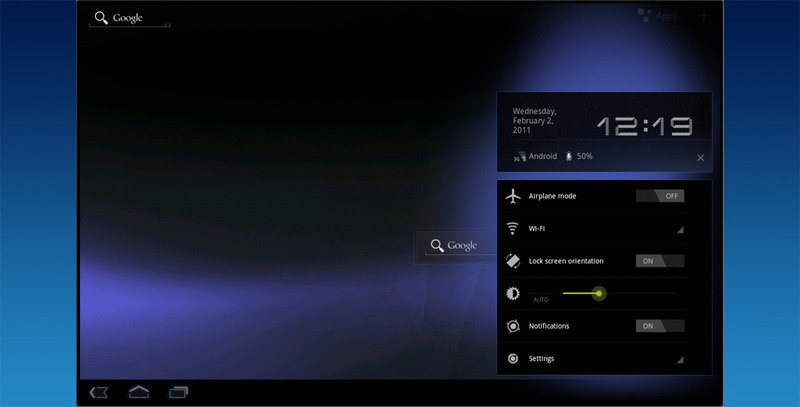 Honeycomb fully supports multi-touch system wide, making it possible to interact with two widgets at once. There are major performance improvements including hardware acceleration for improved graphics capabilities. This makes playing quality games entirely possible. Google Talk now includes video chatting capabilities out of the box, offering some competition to Apple FaceTime. A new set of effects and transitions will let developers easily polish their application too. While Apple iPad, iPhone, and iPod Touch users can choose to browse, purchase, and download apps from iTunes, Android owners had to rely on their mobile Marketplace. While it isn’t problematic, the small interface makes it difficult to discover new applications. Google finally launched a browser-based Android Marketplace Web Store, which was initially demoed at Google I/O last year. Android users can install apps to their device wirelessly from any browser over WiFi or a mobile network. Google also makes it easy to share apps with friends through social networks. Like the Apple App Store, the web interface lists featured, top paid, and top free apps as well.